Looking for your next adventure while cruising the Western Caribbean? If your cruise ship stops in at either the Port of Roatan in Coxen Hole or at Mahogany Bay, take advantage of the beauty and convenience of Blue Harbor Tropical Arboretum. 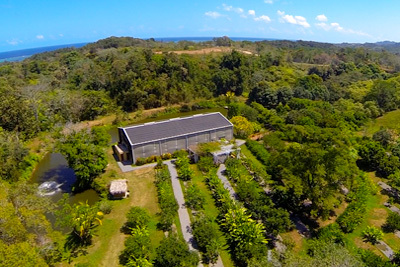 With shuttles available to pick you up and drop you back off at your port in a timely manner, Blue Harbor Tropical Arboretum provides the convenience and security you need for an enjoyable activity. This family-friendly location offers self-guided or guided tours around the central grounds of the Arboretum, including the hydroponic farm, outdoor fruit tree plantation, and the Caribbean’s largest Botanical Conservatory housing some of the region’s most unique flora as well as an impressive 12-foot waterfall. Enjoy the serenity of this location and discover the tropical beauty that Roatan has to offer. Also at the central welcome area, The Porch offers cold refreshments and small meals, along with a variety of snacks. Take advantage of this convenience and enjoy some local fare away from the port. Restrooms and picnic tables are available for guests’ convenience. If your group is looking for a more exciting adventure while in port on Roatan, look no further than the Blue Harbor Tropical Arboretum hiking trail or mud run/obstacle course challenge. The trail can be used by hikers for excellent bird watching and to enjoy the stunning ocean and hilltop views. Or – if you’d like to take the full challenge – the same trail serves as the island’s obstacle course and mud run. Ever heard of Spartan Races and Tough Mudders? Here’s your chance to show your friends back home how tough you truly are! Advance booking is required, just so the staff ensures each obstacle is ready and each mud pit is full. Bring a change of clothes – you will need it! View our tour pages for more details on our current cruiseship tour packages.